Here is a vastly speeded up (15 x) video of me cutting the lower side of my Brian May Red Special guitar neck, Apologies for the presence of my Hobbit like bare feet in the background! Unfortunately, there was a SNAFU literally a few minutes before the end of the roughing toolpath when the loose side piece interfered with the cutter and caused it to lose steps and dig into the headstock! This was foreseeable and I did consider that this might happen but forgot to intervene and stabilise or remove it. 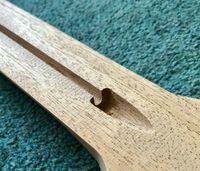 I am preparing two further Khaya neck blanks which are wider and the cutter path will not run outside the width breaking up the sides as with these first two stocks. I elected to continue with the finishing toolpath and I'm glad I did because it the end result was highly satisfactory. 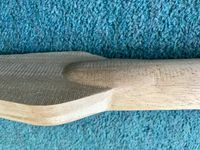 I did about 30-45 minutes of filing and sanding outside in the sun and was rather pleased with the neck at that stage. 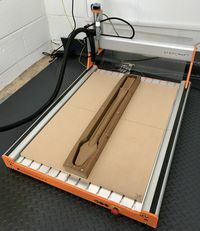 It certainly gives me confidence that the tool paths are valid and without any glitches caused by operator inexperience will run to completion and produce a fine looking neck. I was particularly pleased with the volute bump area. The total cut time was about 2 1/2 hours but the video is condensed to less than 10 minutes. I managed a successful cut of the entire neck two days ago. Some pictures are attached to this post. The toolpath was not 100% satisfactory but no unrecoverable damage was caused. The machine cut a number of strange indentations which, as far as I can judge, were unnecessary and missed some areas on one side during the finishing toolpath. These appear to be caused by toolpatch calculation anomalies rather than machining issues. Nevertheless, this a 98% satisfactory job.